Voeg een uniek randje aan uw souvenirfoto's toe door tijdens deze 4-uur durende wandeling uw lens naar Londen's oogverblindende straatkunst te draaien. Volg je privégids, een professionele fotograaf, door de straatjes en geheime schuilplaatsen van kleurrijke Shoreditch en ontdek de geïnspireerde creaties van beroemde straatartiesten zoals Roa, Eine, Stik en Shepard Fairey. 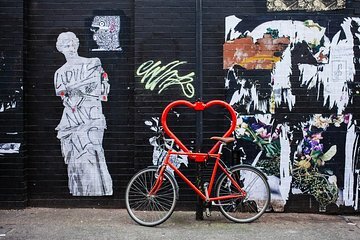 Met deskundige privélessen en insidertips krijg je gegarandeerd een aantal fantastische foto's en leer je alles over de kunstscene in East End in Londen. The tour shows very Intresting sights of London, lead by very special lady. A lot of perfect pictures.....Delightful ‘must do’ experience. The photography tour with Lou is one priceless experience Ill never forget. I have learned a different perspective to the art of photography, and Lou has opened up that dimension with her patience, and passion for teaching. We often got distracted with finding that perfect shot in a given scene, and took for granted the little things around it that brings out life in your picture. Shoreditch has that perfect vibe and character to get you into the mood of inspirations. Lou has that eye for those angles that are often overlooked and she will teach you how to find them and create a story from your picture. Weve managed to turn very ordinary scenes into an amazing shot just by that little tweak on the settings of your camera. The pace of the tour is nice and slow, allowing time for short coffee breaks to review some of the pictures taken. Ive also learned a lot about the history of Shoreditch with Lou while walking through small alleys and backstreets. Truly an off the beaten track photography tour I have always enjoyed in every city I visited. Id highly recommend this tour, even non-professional Photographers with an ordinary camera should find this tour very enriching... kid you not. Lou is a creative, opportunistic photographer. I really enjoyed the three hours we spent exploring Shoreditch, a very friendly and street art section of London. She pointed out areas that were ideal for capturing images unique to the area, that told the neighborhood story, but what I found most valuable was her expert knowledge of my Canon camera. She taught me how to use features I had previously ignored. I much appreciate her help and think any serious photographer could benefit from this tour.